Home > Resources > Backup Samsung > How to Transfer SMS from Samsung Galaxy to Computer Effectively? 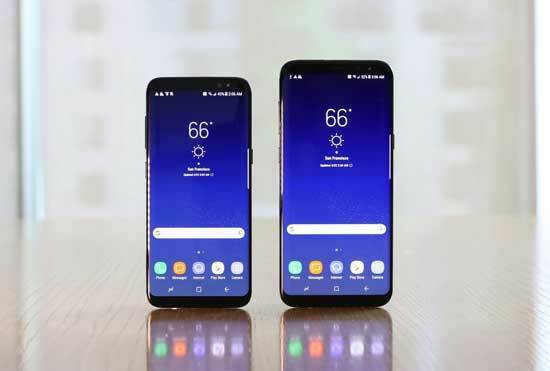 To delete messages on Samsung is unlikely because that the storage space on mobile phone is not enough, but more because there are too many messages on your Samsung device, making it hard to find out one certain text message on your phone. And sometimes it is more difficult to get back deleted important messages after mistakenly deleting them from your Samsung phone, unless you have a better solution. So how do you deal with this case? The best way to get in the habit of backup and transfer Samsung SMS to computer ahead of schedule, so even you accidentally delete all text messages on your Samsung device, you can easily view and recover them from computer at any time. In fact, in order to transfer text messages from Samsung phone to computer, a special tool like Samsung Messages Backup (Windows/Mac) can perfectly help you save your messages to computer according to your needs. - Manager (edit, import, export, delete, refresh) data on Samsung device, such as contacts, text messages, call logs, SMS, music, photos, videos, books and etc. What's more, it is compatible with not only Samsung devices but also the other Android devices, such as LG, HTC, Sony, Huawei, Motorola, ZTE and etc. For Samsung phones, it supports to work with Samsung Galaxy S9+/S9/S8+/S8/S7/S6/S5/S4, Samsung Galaxy Note 8/Note 7/Note 6/Note 5/Note 4, Samsung J3/J3 Pro, Samsung Galaxy A9/A8/A7/A5 and etc. So you don't need to worry about the compatibility of the Samsung Messages Backup program at all. Now, please download the free trails of the program in Windows or Mac version on your computer and refer to the following steps to backup Samsung messages to computer without hassle. Please make sure to install the right version of the program on your PC or Mac before going further. This tutorial is about to take Windows version of the program as an example, Mac users can also refer to the same steps to backup Samsung messages to MacBook as well. Now, let's get started together. Step 1. Connect your Samsung to PC and launch the program. Plug your Galaxy to the computer and then launch the program. If it is the first time you connect your Samsung phone to the program, you might be asked to enable USB debugging on your phone with the prompt on screen. Next time, the program will detect your device automatically. Step 2. Preview and select text messages on Samsung phone for transfer. After turning on USB debugging on your phone, the program will recognize your phone and show the main interface as below. 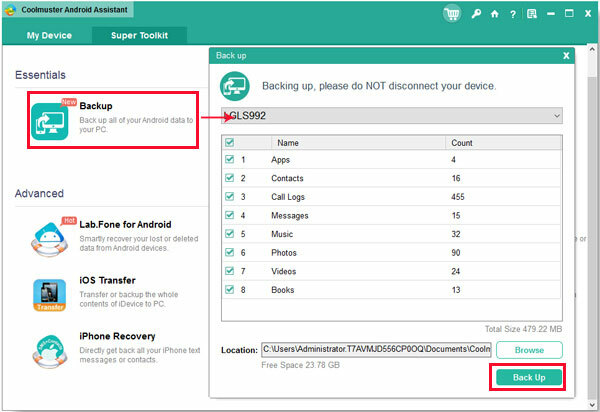 This means you device is successfully connected to the program, and you might enter different file section to view and manage your Samsung data as you like. Step 3. Transfer SMS messages to PC selectively or in a batch. - Click on the "Super Toolkit" tab on the top and hit "Backup" button, you can select "Messages" in the pop-up window and hit "Back Up" button to backup the whole message contents from iPhone to your personal computer immediately. Here you can choose the location where you want to store the Samsung messages backup file as you like by clicking "Browse" button. - If you don't want to export all messages, just click "SMS" tab in the left panel, and then you'll see the detailed SMS messages in the right panel. Mark the files you want to transfer and then click "Export" button to finish the process. You can choose the output format for text messages according to your needs. The exported messages will be saved in XML (*.xml), TEXT (*.txt), HTML (*.html), CSV (*.CSV) or BAK (*.bak) format on your computer. Among these output formats, Samsung messages can be viewed in HTML, TEXT and CSV formats while they cannot be read in BAK and XML formats. You can choose the related format before transferring to open and read Samsung messages as you like. - For users who selectively transfer Samsung SMS to computer, please click "Import" button to select and import messages from computer to Samsung devices. - For users who transfer all Samsung messages to computer with 1-click Backup feature, please click "Restore" button on Super Toolkit section to select a backup of Samsung messages on computer and hit "Restore" button to finish the whole process. Here please be noted that you can restore the backup files to any Android phone, including but not limited to the Samsung phone you have backed up your text messages. See? It's that simple to back up your text messages from Samsung to computer. Please don't hesitate to download the program on your computer and manage your messages on Samsung Galaxy S9/S9 Plus/S8/S8 Plus/S7/S7 Plus/S6/S6 Plus/S5 and more. If you have any doubt about the post, please leave your questions or suggestions below, we will try our best to solve it.